After receiving approximately 4 inches of rain in a period of a half hour, it seemed as if the two lakes on the Isthmus of Madison connected together. 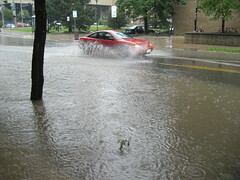 Almost all of the streets south of Johnson St on campus flooded. 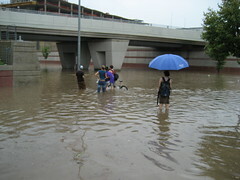 The street was filled with stalled vehicles and students playing in the massive street lakes. At several points the water reached up to waist height. Lower-sitting classrooms on campus flooded as well, like in the Humanities and Computer Science buildings, among others. I think I heard your blog calling. It's yearning to be updated!